Click the red button labeled “New Postcard”. 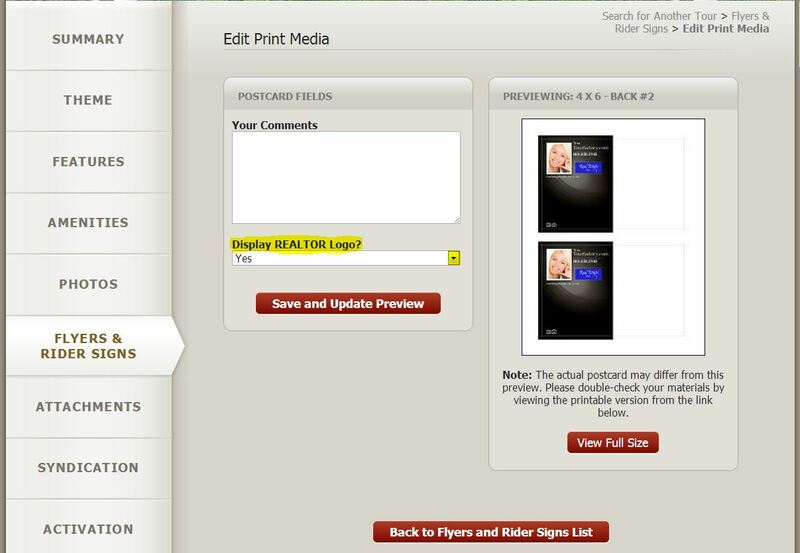 You will now see thumbnail images of all our different postcard templates. You will notice there are templates for both the front and back sides of the postcard. Start with a “Front” template. Once you have found a template you would like to use, simply click the thumbnail image of that template. 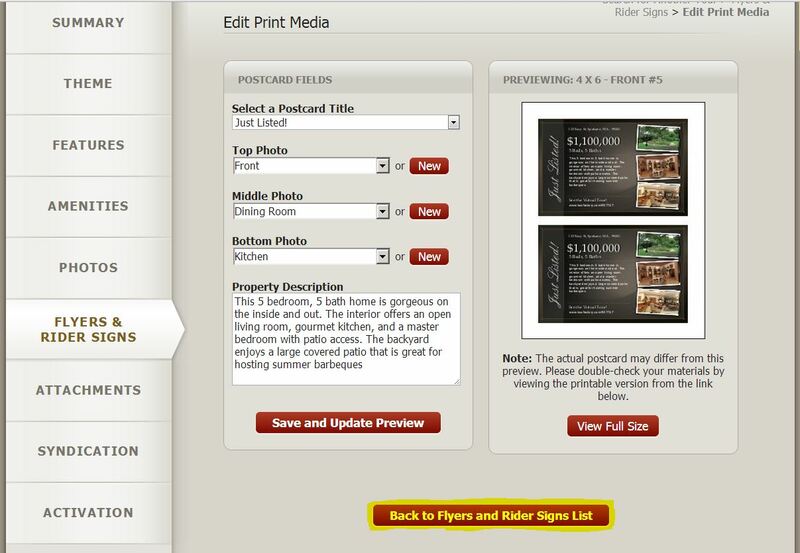 Select your “Postcard Title” by using the first drop-down menu. You can now select the photo(s) you would like to use on the postcard. 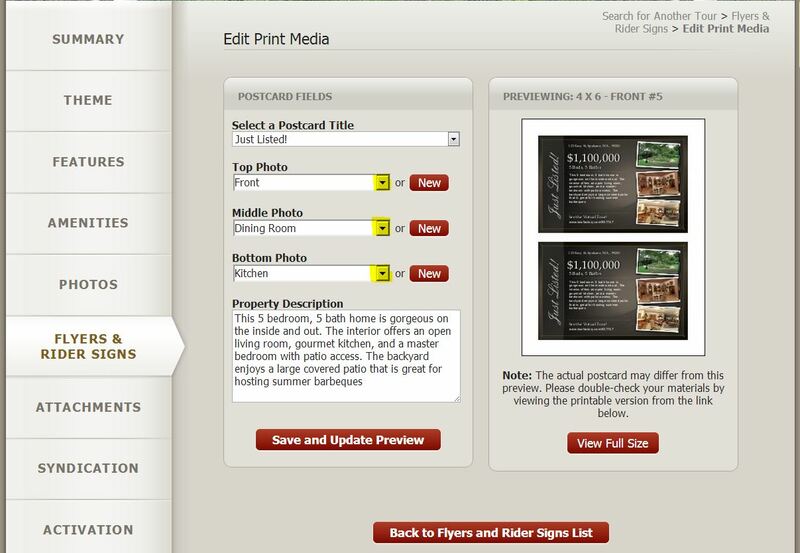 To use a photo that has already been uploaded to your property website, click the drop-down menu under the photo position you would like to change and select the photo from the list. 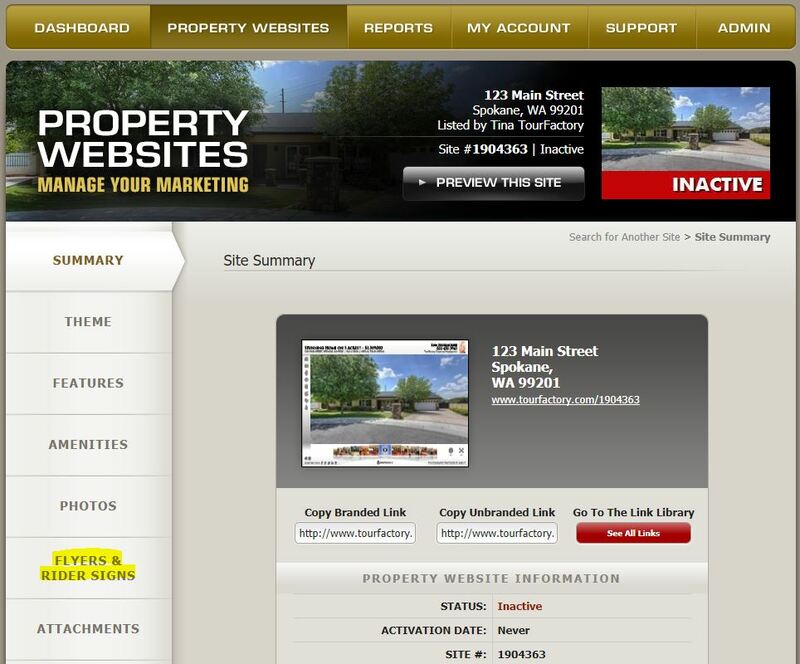 Expert Tip – Your Property Website and Agent Inventory QR codes are listed at the bottom of the drop down. These can be added to the postcard in any image position. Once you have selected all your photos, enter the property description you would like displayed on the postcard. Type in the text box labeled “Property Description” to enter your text. Expert Tip – The text displayed will be automatically sized based on the length of the description. If you preview your postcard and the text is too small, remove some of the description text to enlarge it. Note: If you do not see this box, the postcard template you have chosen was not designed to include a description. If you would like description included on your postcard, please select a different template. You will see the small preview of the postcard refresh, click “View Full Size” to see the front of your postcard! 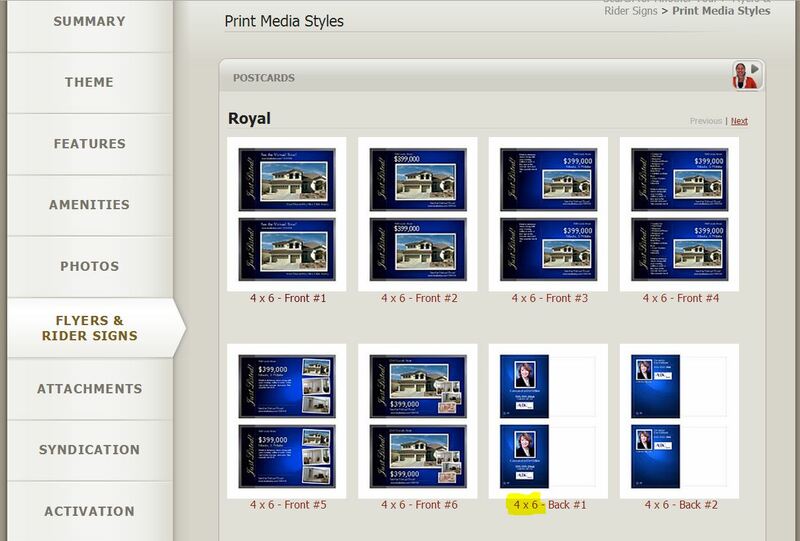 If you need to make any edits to the information entered, close your full-size postcard preview and make any necessary changes on the Edit Print Media page. Note: If any of the listing details (MLS Number, price, beds, baths, etc.) need to be changed, you will need to change them on the Features tab. Now we need to create the backside of your postcard. Click button labeled “Back to Flyers and Rider Signs List”. Choose the back template you would like to use. Make sure to match the template size with what you selected for your front template (6″x4″ or 5″x3.75″). Enter any comments you would like to appear on the back. Note: If you do not see this box, the postcard template you have chosen was not designed to include comments on the back. If you would like comments included, please select a different back template. Choose if you would like the REALTOR logo displayed on your postcard. Click “Save and Update Preview”. You will see the small preview of the postcard refresh, click View Full Size to see the back of your postcard. 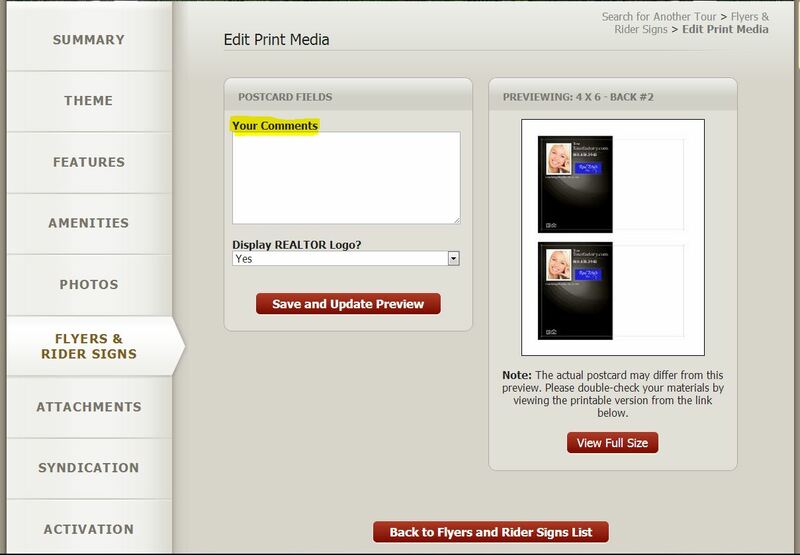 If you need to make any edits to the information entered, close your full-size postcard preview and make any necessary changes on the Edit Print Media page. The front and back of your postcard are now ready to be printed.